The # 1 broadcasting forum on the web! 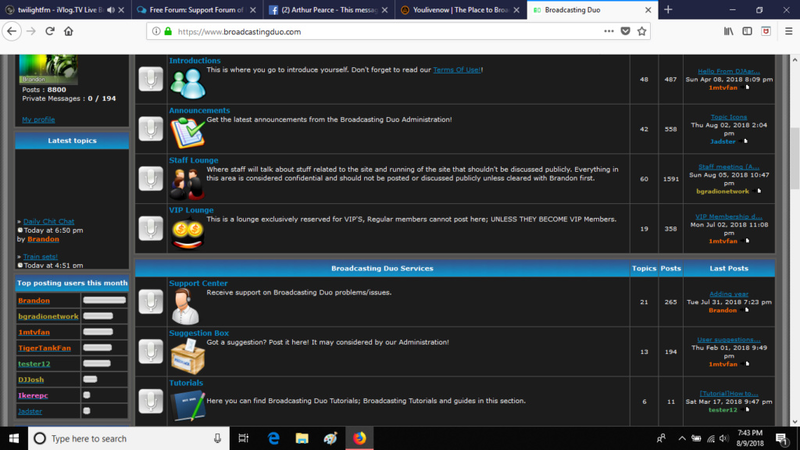 Forum Description: Broadcasting Duo is one of the fastest growing and rapidly expanding private broadcasting forums on the web, come join the broadcasting community that puts it's users first. You will be glad you did. -Brandon ~ Broadcasting Duo Founder! 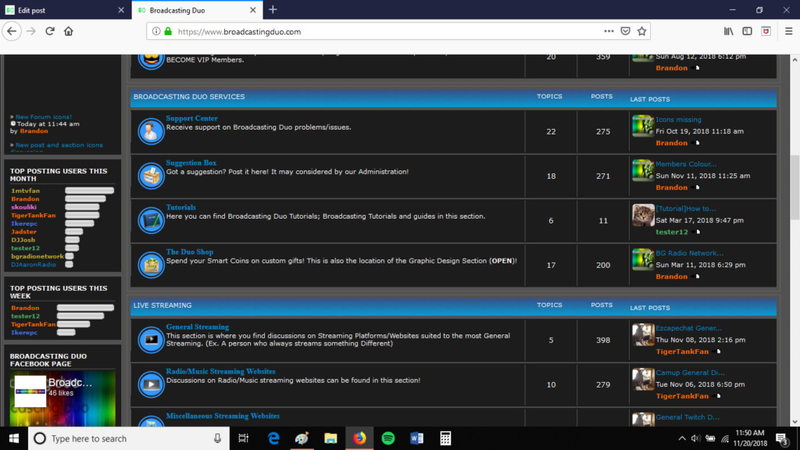 Broadcasting Duo now has a custom domain name, the site can now be found at https://www.broadcastingduo.com/ along with our free domain name. We have added new sections for OBS and Wirecast (both of which are media encoding software). We are hiring for more moderators to join our team. If you may be interested, then please read this topic and if you wish to apply, simply fill out the application form and post your application in the same topic. http://broadcastingduo.forumotion.com/t110-moderator-applications-now-hiring . We are hiring graphic designers, if you are interested please see the following topic: https://www.broadcastingduo.com/t60-graphic-designers-applications . That is all the updates I have for now. Congratulations on your updates and the new domain @brandon_g. Very well! Broadcasting Duo Update: Site Re organization! We have re organized the site sections in a effort to optimize the site layout as much as possible. The number of sections are alot less now, making it easier and quicker to get around the site. We hope everyone likes the new layout . A NEW section for Discord has been added. Broadcasting Duo Update: Site software version switch! We have switched the forum software version over from phpbb2 to phpbb3. This was done in effort to try and make the forum look a little more modern and also make it easier to do future updates. The site design has a few changes as a result of the switch, here is a preview of the forum before and after switch. For full details on the update/changes and/or to report any bugs you may notice please see the official announcement topic. We are always open to suggestions that can help improve the site and it's overall user experience. If you think you have any suggestions that could help us improve the site, please don't hesitate to post them in this topic. We are still hiring graphic designers, if you are interested please see the following topic: https://www.broadcastingduo.com/t60-graphic-designers-applications . Broadcasting Duo Update: Feedback survery! As part of our continuing efforts to try and improve the site and overall experience, we decided to create a survey to get visitor feedback and suggestions on what you, the user wants to see changed. We encourage all visitors and users to take a couple minutes to fill out the survey. While doing so, please be as honest as possible, we are looking for honest feedback, good or bad. If you would like to help us make the site better and want fill out the survey, you can do so at this link: https://www.surveymonkey.com/r/XFLBNJT , or for more information see the official announcement topic: https://www.broadcastingduo.com/t715-broadcasting-duo-feedback-survey . As an added benefit for taking it, any registered member of Broadcasting Duo that takes the survey, will receive 100 smart coins (forum currency). We are still hiring for graphic designers, if your interested, please send me a pm here or on Broadcasting Duo. Broadcasting Duo Update: New post legend icons! It is with great pleasure that I announce that @Skouliki has joined the team as a Graphic Designer. We are excited to have Skouliki and her awesome skills and insight on our team and we welcome her with open arms. Please join us in welcoming her to the team: https://www.broadcastingduo.com/t723-welcome-to-the-graphic-design-team-skouliki . @Ikerepc is transferred from the Graphic Design team to the Moderators team. This move was done because he no longer does graphic designing and we felt he would be better suited for the role of Moderator. We are sure he will do great in his new position. I would like to give a very special thanks to @Skouliki for designing these awesome new icons for us. We hope everyone likes the new icons and sees them as an improvement over the old ones. For full details please see the official announcement topic. Select code feature has been re styled to better reflect the design and overall appearance of the site. Special thanks to Skouliki for providing the code used to make the improvements. Quote box has gotten a MINOR re styling as well, special thanks again to Skouliki for providing this code as well. Please keep your eyes peeled to this topic and our social media pages over the next couple months, as there are more great site improvements coming VERY SOON. 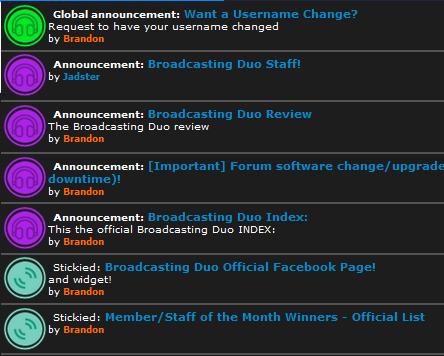 Broadcasting Duo Update: New forum icons! We have BRAND NEW forum icons, the new icons are way more sleek and modern than the old ones and give the forum a much nicer overall appearance. Special thanks to @Ikerepc for creating the code and editing some of the images. 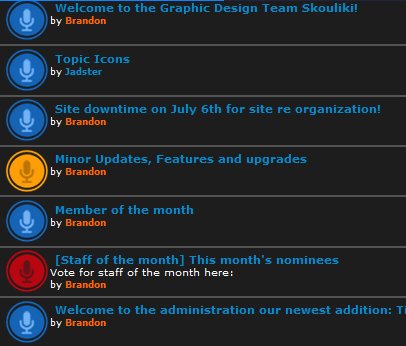 We hope you all like the new icons and view them as an improvement to the site. We have brand new staff and vip member ranks. The new ones are much more modern and nice than the old ones. Special thanks to @Skouliki for making them. @Jadster rejoins the team as an Admin, we welcome him back to team with welcome arms! More updates to the site to come in the next couple weeks, so please keep your eyes peeled to this topic and our social media! Broadcasting Duo Update: NEW banner! Broadcasting Duo has a BRAND NEW site banner/logo! The new banner, is designed to be more modern and sleek the old one and best of all, it fits the new overall appearance of the site. Special thanks to @Skouliki for designing this excellent banner for us! For complete details on the new banner, please see the official announcement topic: https://www.broadcastingduo.com/t754-new-banner. That is the only update I have for now. Be sure to keep your eyes out for more updates still to come!